Now that you've selected XS Trash as your source for affordable junk cleanup, you won't have to pay extreme Bobcat rental prices. Our team is proud to offer additional Bobcat services to load your trash and debris, saving you time and money. 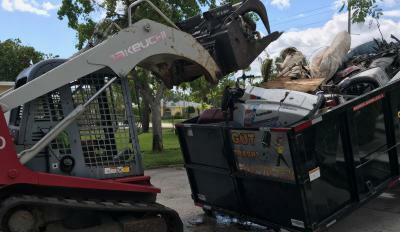 Our full service junk, trash & debris removal company is licensed, bonded, and insured to delivered affordable and convenient services including reliable assistance from our licensed bobcat operators. Call today to find out more our Bobcat rental prices, We always aim for 100% customer satisfaction. The professionals at XS Trash make it fast and east to clear your work site from debris and bulk items. With our licensed Bobcat operators on the job, you can relax knowing that our licensed experts are on the job. Plus, with our same-day service options, you can request our services when you need them most, even when it's last minute. In our 21-yard-long service trucks, we can haul more debris in fewer loads, saving you valuable time and money. With our dedication to eco-friendly methods of disposal, you can always expect any eligible items to be handled responsible. Call today for a FREE estimate on our Bobcat rental prices.